The humble butterfly could hold the key to unlocking new techniques to make solar energy cheaper and more efficient, pioneering new research has shown. A team of experts from the University of Exeter has examined new techniques for generating photovoltaic (PV) energy - or ways in which to convert light into power. Mimicking the v-shaped posture adopted by a butterfly species to heat up its flight muscles before take-off, the amount of power produced by solar panels can increase by almost 50 percent, a study led by an Indian-origin scientist has found. Increased efficiency of solar energy production with the new technique could also lower its cost. "Biomimicry in engineering is not new. However, this truly multidisciplinary research shows pathways to develop low cost solar power that have not been done before," said study lead author Tapas Mallick, professor at University of Exeter in Britain. The Cabbage White butterflies are known to take flight before other butterflies on cloudy days - which limit how quickly the insects can use the energy from the sun to heat their flight muscles. This ability is thought to be due to the v-shaped posturing they adopt on such days to maximise the concentration of solar energy onto their thorax, which allows for flight. Furthermore, specific sub-structures of the butterflies' wings allow the light from the sun to be reflected most efficiently, ensuring that the flight muscles are warmed to an optimal temperature as quickly as possible. The team of scientists therefore investigated how to replicate the wings to develop a new, lightweight reflective material that could be used in solar energy production. The scientists found that the optimal angle by which the butterfly should hold its wings to increase temperature to its body was around 17 degrees, which increased the temperature by 7.3 degrees Centigrade compared to when held flat. 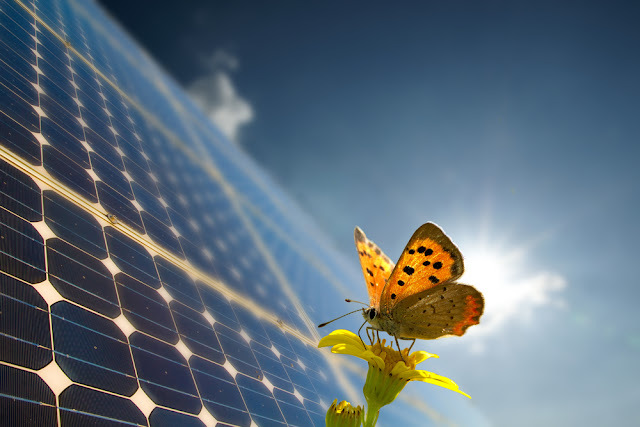 They also showed that by replicating the simple mono-layer of scale cells found in the butterfly wings in solar energy producers, they could vastly improve the power-to-weight rations of future solar concentrators, making them significantly lighter and so more efficient.